With this image I take you back to Zimanga Private Game Reserve for a brief interlude. You will remember I posted some images on my blog after our family's visit to this amazing place last month. This photo is from my first session in the Mkhombe bird hide - where the action was coming thick and fast and recent updates from the reserve show no indication of the current state of affairs being otherwise. 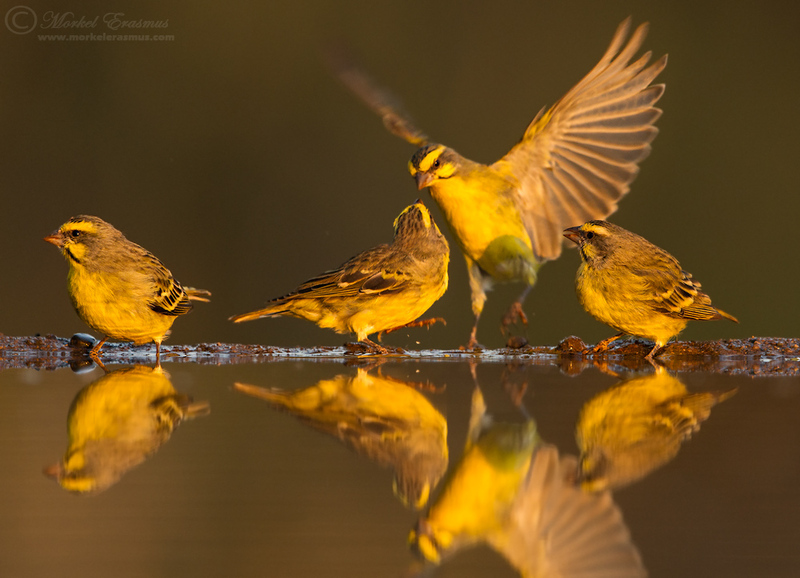 A whole flock of Yellow-fronted Canaries were occupying the waterhole in front of the hide that morning, and the males in particular had very short fuses. With it being my first session in the hide, I was not accustomed to how shallow the depth-of-field would really end up being (the edge of the waterhole is merely 5 meters from the hide), given I was using my 500mm lens. I now know which settings to change for my return next year when I host a Wild Eye workshop there. The end result is that the bird with the outstretched wings was just-just out of my DOF here. I still like the photo, though, and the light is exquisite.